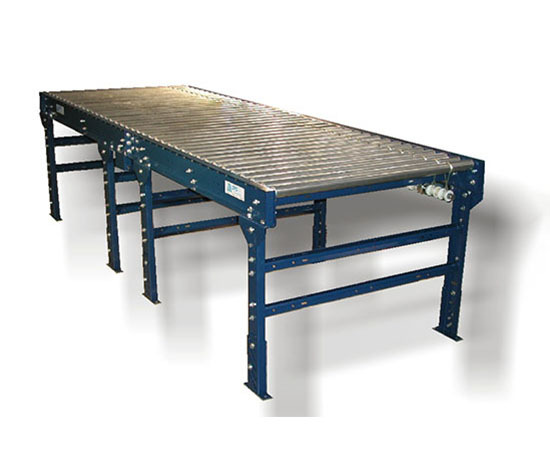 Sytec's Performance Line Shaft Conveyor (PLSC) is engineered for small bundle handling and load accumulation. All PLSC comes with adjustable leg stands to set the working height for comfortable, ergonomic conditions. This also allows the conveyor to be set at the required height at the feed end of the conveyor. Height differences between the beginning and ending of the conveyor line can be adjusted through out the length of the line. Line-shaft driven roller conveyor. The rollers are driven using friction drive spools on the drive shaft. Loads can be stopped with a physical barrier, or with pneumatic brakes. Offers optional devices for load transfer onto or off the conveyor line, such as a Belt Transfer Device (BTD).